It seems that Microsoft is giving away brand-new Acer Ferrari laptops as Christmas gifts to some bloggers out there. These people have apparently been praising the upcoming Microsoft Vista operating system in particularly clever (and objective, I'm sure) ways, and so now get their rewards. If you haven't had the chance to drool over an Acer Ferrari yet, have a look and tell me that you don't want one. Look, Mr Gates, I know I wrote a little something about the Vista EULA some time ago, and I know I've been blogging about Linux every now and then, but is it really too late for atonement? Perhaps I could write some positive words about the XML-based new layout format you hope to backstab, I mean, replace, PDF with, or maybe I could join the MS choir about the benefits of the Office XML format? Or I could just write a blog about the Microsoft-Novell agreement where you hope to short-circuit the open source market? Yes, social stories are indeed very useful. We use social stories to help my son with various day-to-day chores and such. In this case, I couldn't get past the TM symbol. I would probably buy that book if it weren't for the TM inserted everywhere... It's the autie in me speaking, and that particular detail is all I can see now. There's still the TEACCH workbook also authored by Carol Gray. Thankfully. Lately I've been rediscovering C. The programming language, that is. Mostly, I've been doing it by reading Brian Kernighan and Dennis Ritchie's classic tutorial on the language, The C Programming Language. By today's standards, it's a rather thin book, only 272 pages, but it's the best book ever written on the subject, and vastly superior to any 1,000-page Learn C in 21 days and the like. If I was allowed a single computer book to emulate, it would be it, the classic K&R. They don't get any better than K&R. The book's concise yet thorough, easy to read, and never wordy. And it was the first book to showcase a Hello World example program. Now, I'm not a real programmer by any means. While some of my code is actually used out there, and I've been paid good money for it, most is rather bad, wordy, and overly ambitious. Which brings me to another book I'm craving at the moment: Code Complete, by Steven McConnell. It's a general-purpose volume from Microsoft Press (of all places) on writing good, professional-quality code, containing best practices of all sorts, from tips on testing to the pseudo-code method, and much, much more. I've been reading it at the local bookstore for days now, and while it's way too expensive to buy there, it's more reasonably priced at Amazon and other online Meccas. It's my current #1 obsession to get that book, and while I really don't have the money right now, I fully expect to give in to the temptation shortly. A few abstract clicks late one night, a PayPal message, and it's mine. Social stories are often used to explain the intricacies of social interaction and other abstractions to autistic people. They look a lot like a comic book; rather than using complicated words and thus the inevitable abstractions, often beyond the autistic mind, they use pictures and sometimes text to explain a concept. 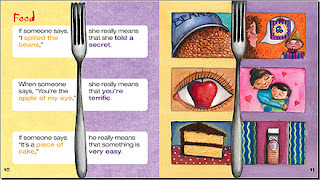 A good example of a typical social story is the image to the left, developed to explain some simple similes for autistic children. Often, parents of autistic children will have ready-made images for various purposes, from brushing your teeth in the morning to welcoming guests to the house in a proper manner. Social stories can be an excellent, often invaluable, tool, and have saved the day for probably countless families with kids on the spectrum. Jessica Kingsley Publishers, a company specializing in part on Asperger/autism literature, publishes a sizable portion of the available books on autism spectrum disorders, so it came as no big surprise to me to find Revealing the Hidden Social Code by Carol Gray prominently displayed. The book promises to explain "key elements of Social StoriesTM, review the guidelines for writing them, and help writers to structure and develop their stories", and indeed, it would have been one of the more authoritative guides on the topic since Carol Gray is the originator of the concept, had it not been for a little detail. Everywhere, those two letters. T and M. And Social Stories, capitalized. Jessica Kingsley Publishers or Carol Gray, or both, regard the concept as trademarked, and so, everywhere where the two words Social and Stories are mentioned in each other's immediate vicinity, the letters T and M follow, superscripted. Bla bla Social StoriesTM bla bla bla bla Social StoriesTM bla bla. Bla bla bla bla Social StoriesTM bla bla bla Social StoriesTM bla. Social StoriesTM bla bla bla bla bla. See what I mean? Once you've noticed, it's impossible to not see it. See how those two letters stand out, see how they destroy whatever context the author wished to dwell in? You can't not see it. So, for me at least, it's now impossible to buy that book because I'm afraid I'll learn not about social stories as such, but about how important it is to preserve your questionable trademark, no matter the cost.